NSFA, Panacan, Davao City - MGen. 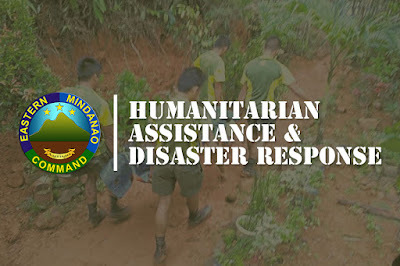 Felimon Santos Jr., Commander, Eastern Mindanao Command (EMC), directed military units in Agusan Del Norte to assist Agusan Norte Provincial Disaster Risk Reduction Management Office (ADNPDRRMO) in the search and retrieval of miners who were buried in a landslide in a small scale mining community at Mt Manhupao, Brgy. Bangonay, Jabonga, ADN on the evening of January 20, 2019. "Provide search and retrieval capability and other humanitarian assistance to PDRRMO without compromising the safety and security of our responding troops and other search and rescue groups," said MGen. Santos Jr. in his directive. The report further states that a certain Rex Penig also of Brgy Hinayupan, a certain Jay-ay Matanog of San Miguel, Surigao Del Sur and one identified only as Gang-gang of Sibagat, Agusan Del Sur are missing as a result of the incident. Meanwhile, Alan Iligan also of Brgy Hinapuyan was brought at ADN provincial hospital for medication.